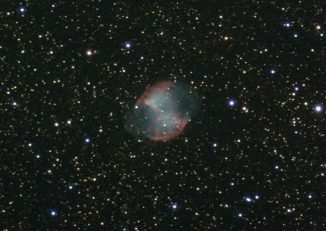 Today I used a break in the clouds to test how the astro-modified Nikon D7000 works with a h-alpha Filter. 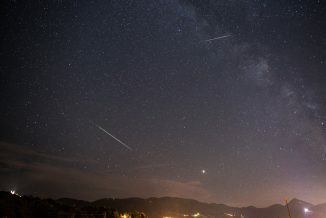 As the weather was very unstable, I didn’t set up the laptop for guiding, so some images were unusable due to trailing and passing clouds and full cloud cover at the end of the exposure resulted in oly 83x30s unguided exposures. Which way too short, but I am happy with the result under these circumstances. 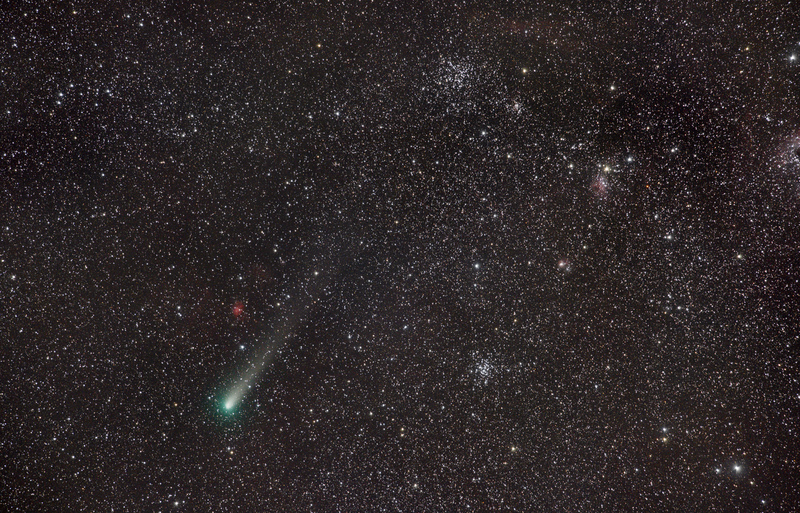 NGC1499, Baader Planetarium, 1,25″ h-alpha Filter, 83x30s (41,5m) exposure, Astro-Professional 80mm f/7 refractor. 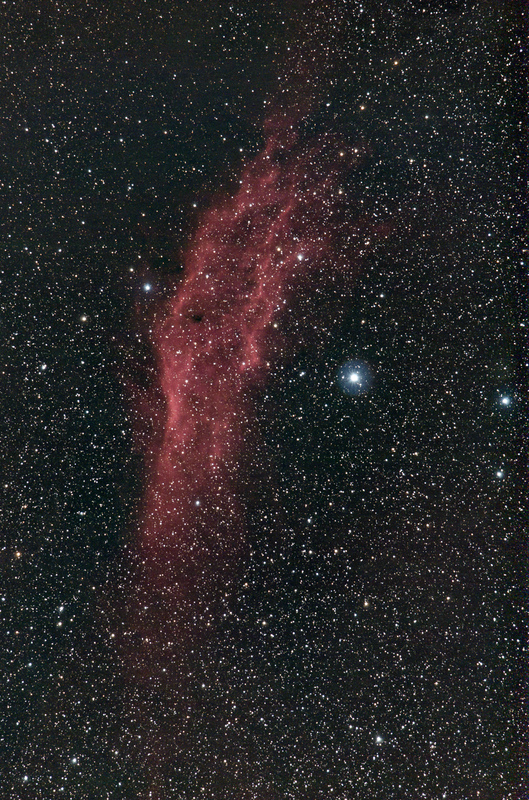 On November 5th I had the opportunity to do another test, this time using the 300mm lens, I also used the California Nebula as the target. 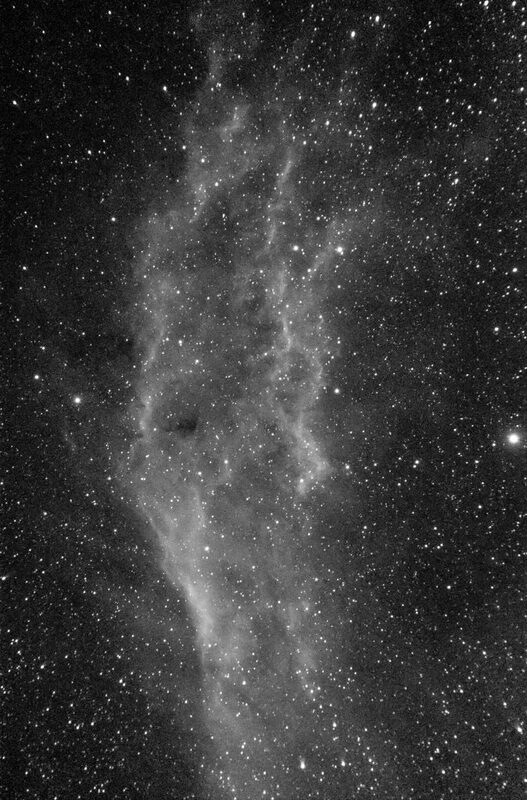 NGC1499, the California Nebula, 192x30s (1h 21min), Nikon D7000a, AF-S NIKKOR 300 mm 1:4E PF ED VR, calibrated in Regim, processed in Fitswork, Photoshop and Lightroom. Mount: Vixen Polarie. The California nebula is hydrogen gas which is irradiated by the intense UV radiaton from Xi Persei, the bright star near the center of the image. It is about 1250 light years distant and is one of the intrinsically brightest and hottest stars visible to the unaided eye. It weighs in at about 40 solar masses. The surface temperature is a whopping 35000 Kelvin. After I bought the D750 I rarely used the D7000 any more. As it has been heavily used it would probably not get a lot if I sold it, so It mostly stayed in the closet. 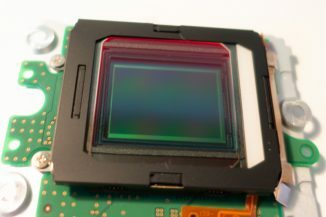 Then I learned that the Nikon D7000 sensor is still used in current astronomical CMOS cameras (e.g. ASI071MC Pro or QHY168C) apart from the cooled sensor the main advantage of the astronomical cameras is the better response to H-alpha emission because of different IR-cutoff wavelength. 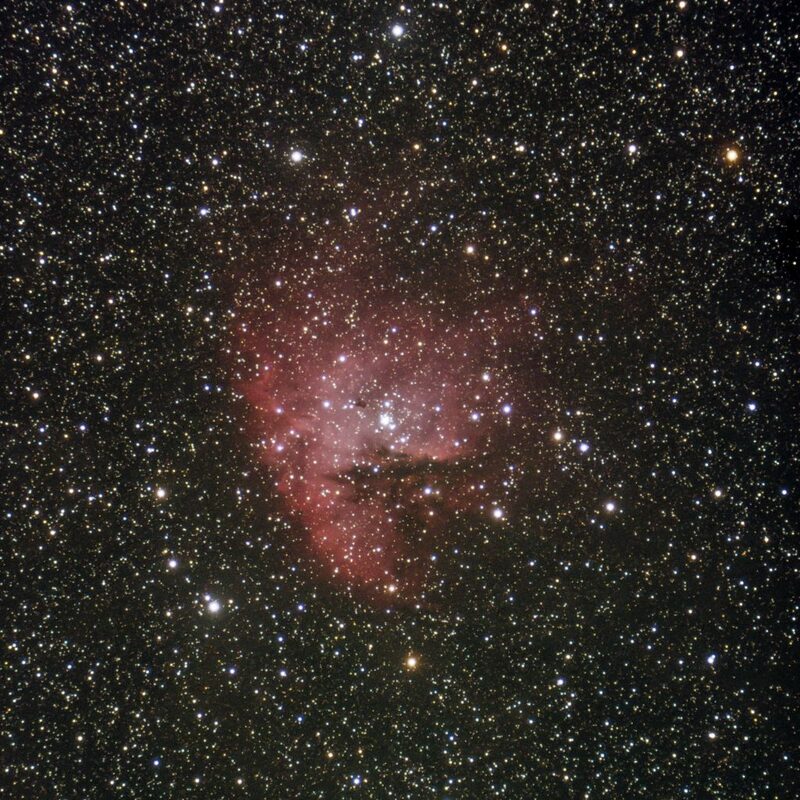 H-alpha emission is the red light created when young, hot stars excite hydrogen gas in the interstellar medium. Regions of onging star birth are usually distinctly red. Sadly regular DSLR cameras pick up that red light only very faintly. 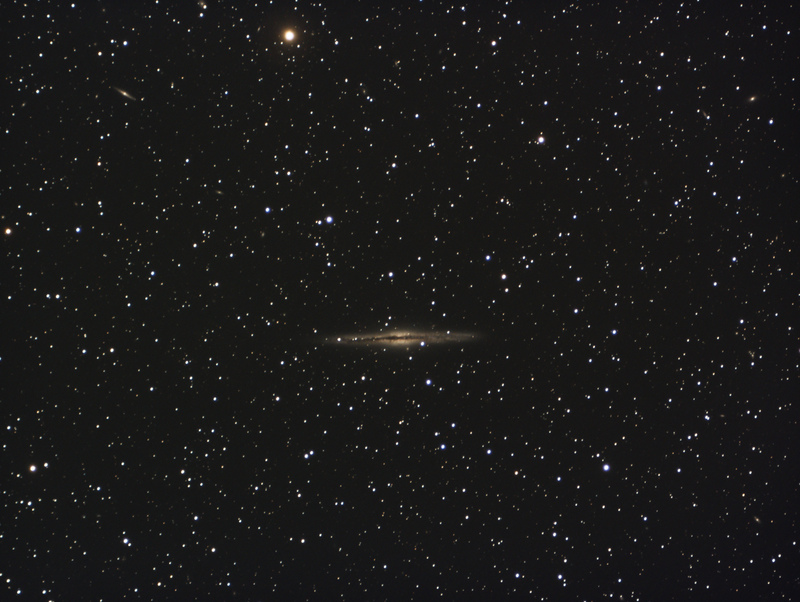 NGC 891 is a beautiful spiral galaxy which is seen perpendicular to it’s rotational axis, so we see it edge on. 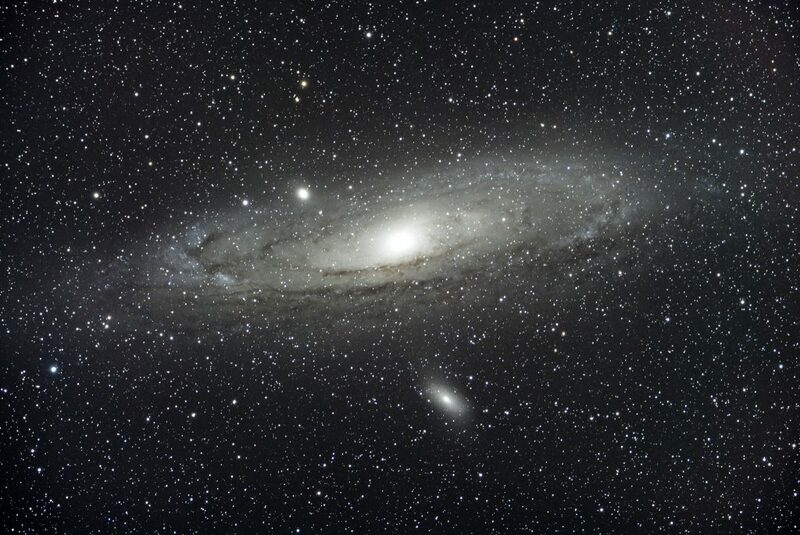 It is located in Andromeda, so there are many foreground stars. 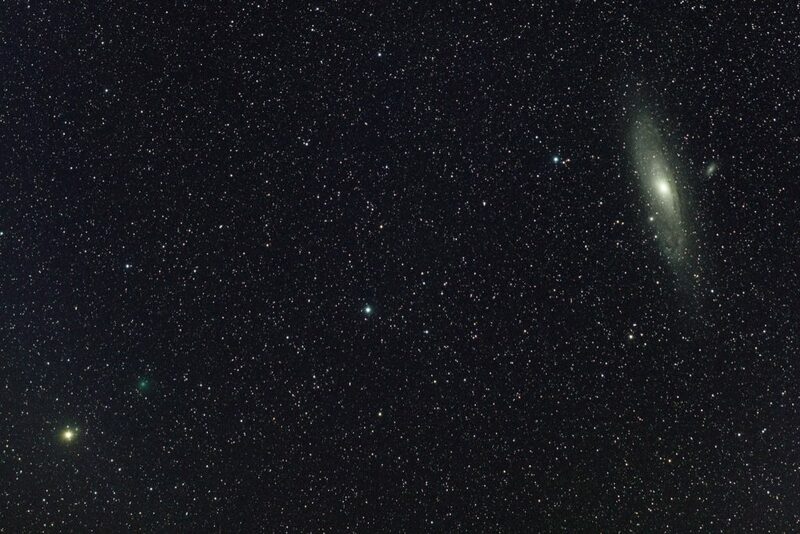 I have seen it in telescopes as small as 15cm aperture, in my 250mm the dust lane becomes visible, but in a larger scope, like the 40cm I recently observed with, it is a really beautiful sight. But of course not as detailed as in this image. NGC 891, Galaxy in Andromeda, distance: ~30 million light-years- 45*180s (2h 15min), QHY163c, Astro-Physics 127mm f/8 refractor.